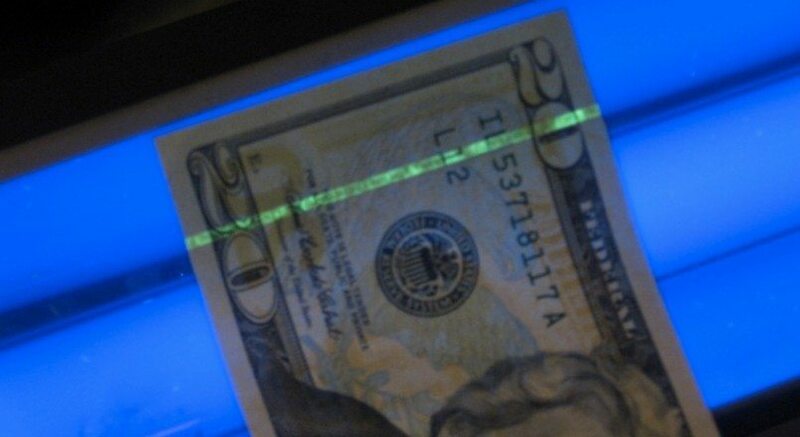 It’s possible to tell if someone has given you counterfeit money by looking at the physical characteristics of the bill, such as ink, colors, and text, or by running the bill under a special scanner or lamp designed to detect counterfeit currency. 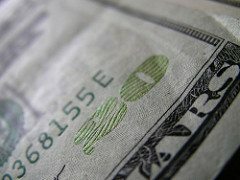 An estimated $147 million worth of counterfeit money is currently circulating in the US. In this guide, we’ll help small business owners equip themselves with the knowledge necessary to detect these fake bills and save thousands of dollars. Counterfeit cash is much less of an issue for businesses that receive most of their revenue through credit card sales. Fattmerchant is an affordable payment processing provider that makes it easy for businesses to take credit card payments. Fattmerchant offers a subscription-based, monthly processing flat fee; next-day funding; and payments processed on secure networks owned and operated by Vantiv. Get a free quote today. Counterfeiters can sometimes duplicate one or two security features, but rarely all of them. So, if you check these 8 features on a bill, you should be able to quickly spot a fake. 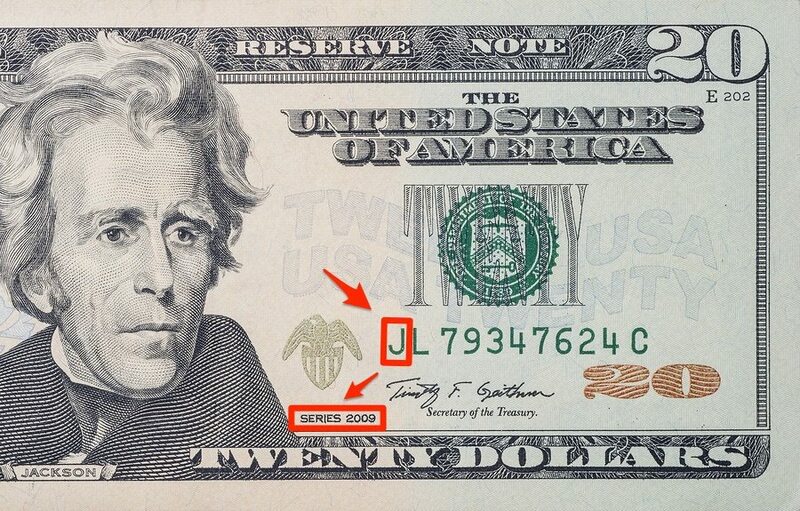 We’ll use a $20 in most of our examples, since that is the most counterfeited denomination. One of the first things to look for when checking to see whether or not a bill is authentic is to see if the bill denomination on the bottom right hand corner has the right color shifting ink. All denominations of $5 or more have this security feature, going back to 1996. Take this $20 for example, the 20 on the bottom right hand corner will have a copper color when you are looking straight at it. 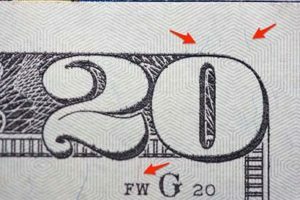 But, if you rotate the top of the bill down so that the bill looks flatter to your eye, it will turn more of a greenish color. See example images below. The left image from a more top-down view is clearly more of a copper color. But, when it is shifted to a flatter plane like the bill on the right, the denomination is much greener. 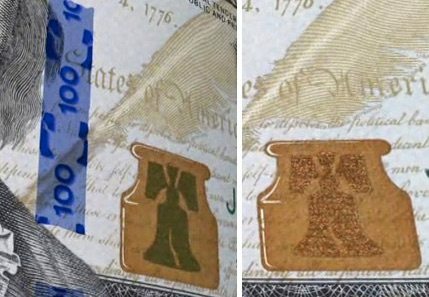 On the new $100 bills, the inkwell also has color shifting ink, turning green and becoming extra visible when shifted to a flatter visual plane (example shows both copper color and green). All authentic US reserve notes have raised printing. You can see the difference in in depth on the picture to the right when it is magnified. Many times, counterfeiters have a tough time duplicating this kind of printing method. To detect raised printing, take your fingernail and run it carefully down the collar/jacket. You should feel an unsmooth texture and some vibration on your nail from the ridges. If not, then you better do an in-depth check on the bill. Bonus: Click here to get time-saving templates, guides, and marketing strategies from our expert retailer who generated over $2 million in revenue per year. 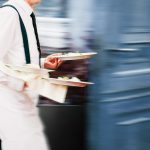 If you notice significantly blurry borders, printing, or text, it is an automatic red flag. 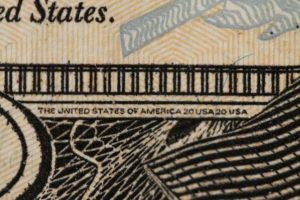 Authentic bills are extremely detailed, made using die-cut printing plates that are capable of creating impressively fine lines. Printers are rarely capable of the same level of detail. Take a close look, especially at the borders, to see if there are any blurred parts in the bill. Another thing to be watching for, is micro-printing. Authentic bills have super fine text located at various places on the bill, as shown on the left. Many times, counterfeiters do not have sophisticated enough printing equipment to duplicate micro-printing finely enough to where it is actually readable. 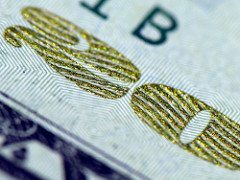 If you get a magnifying glass or put the bills under some other form of magnification, you can generally tell pretty quickly whether or not the micro-printing is authentic. If it is unreadable, then it is probably counterfeit. If you take a close look at an authentic bill (as seen on the right), you will see that there are small red and blue threads woven in and out within the fabric of the bill. 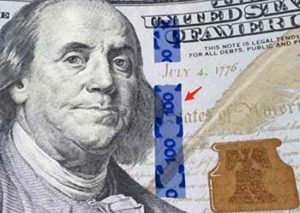 Printers try to reproduce this effect by printing red and blue threads onto the bill in a similar pattern. But, a close look will often reveal that such printing is merely surface level, tipping you off to a counterfeit. The next security feature to look for, is the characteristic watermark. 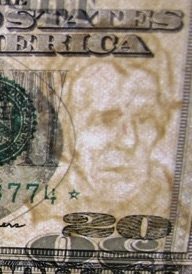 In many of the new bills, the watermark is actually a replica of the face on the bill. In some, it is only an oval spot. There are several things to keep in mind when examining a watermark. The security thread is one of the most distinctive security indicators of an authentic bill. If you hold any bill up to the light, you will see a security strip on an authentic bill. 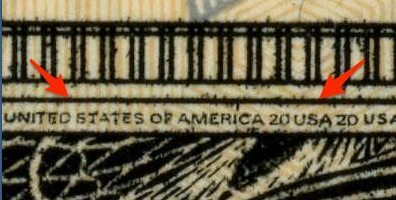 It will have “USA” and the Bill’s denomination, aka “USA 20” running vertically on the bill. The ultimate test is to put the bill under a UV or black light and make sure the bill glows the correct color. This extra security measure was originally added to provide a quick way for bar owners (one of the businesses most commonly targeted to dispose of counterfeit bills) to check the legitimacy of a bill. The newly printed $100 has an extra security feature. There is a visible blue security ribbon down the right middle of the bill that is 3D. If you move it back and forth, you will actually see the number 100 and a variety of little bells will move from side-to-side as the bill shifts. The last thing to check on a bill, is to make sure the serial number matches the supposed series/run year printed on the bill. Each letter that starts a serial number for a bill corresponds to a specific year (letter to year correspondence detailed below). Just be sure to check and make sure the series year stated is a correct match with the letter that starts the serial number, and vice versa (shown above). Here are the letters and the corresponding years/runs they should match with. While you’ve learned the basics of detecting counterfeit bills, we advise you to take additional precautions to safeguard yourself by taking these steps to provide as much protection as possible for your business. 1. Hold your employees accountable. You can reduce retail theft by using a POS that offers cash drawer management. 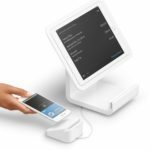 Lightspeed POS lets you set up separate cash drawers for each employee so you can know exactly what denominations come and go during a cashier’s shift. Integrated cash drawer reports also help you identify who isn’t checking for counterfeit bills. Lightspeed also has balancing measures in place to ensure that all cash is accounted for at the end of each cash drawer session. Start a free 14-day trial. 2. Insure your business against counterfeit money. In instances of unknowingly accepting fake currencies, you can make claims against any business losses by filing them with your insurance company. Most business insurance policies should be able to protect you from receiving fake currency; however, it is advisable to check with your agent on the coverage of your plan and up to how much they can cover in the event that this happens. 3. Deposit large payments directly to the bank or via credit cards. As much as possible, try to promote cashless transactions in your establishment to minimize the risks of accepting fake money. Fattmerchant is a great payment processing provider for small businesses since it offers transparent flat-rate fees with no additional markup or contracts starting at $99/month. Get a free quote. Education is the main defense against counterfeit bills. But there are also a variety of products available to help you with the counterfeit detection process such as the ones below. Spoiler Alert: Counterfeit pens are unreliable! All the pen does is check for chemicals common in some of the more poorly done counterfeit bills. But, with the rise of digital printing and counterfeiters specifically treating their bills so they will not respond to the pen test, you can no longer rely on the counterfeit pen to protect your retail business. This tool backlights the bill to reveal the discreet and hidden security features of an authentic bill. However, the individual using this tool must be familiar with the security features to be able to identify any irregularities in a bill. When held up against the lamp’s UV light, the identifying security thread of different bills which we detailed in item #6 above will become much more visible and noticeable. 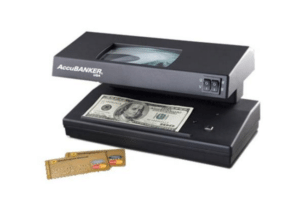 These are simple scanners that detect fake or genuine ink on bills. 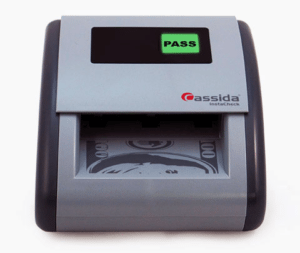 This is the most advanced and efficient counterfeiting test machine as it puts bills into multiple tests – a combination of the functions of the tools mentioned above. It is almost impossible for a fake bill to get through this machine. The only downside is its expensive price tag. Let’s say you find a counterfeit bill, what do you do next? Here are several steps to follow to make sure you are processing the bill and alerting the correct authorities. The police will be sure to want as much information as possible and the more prepared you are, the more information the police will have to aid in their investigation. Jot down things like height, weight, eye color, hair color, and any unique features. A license plate number is great, although that is often not possible. In some cases, there may be remnants of fingerprints, DNA, or possibly even certain processing chemicals that can help the police tie a bill to a certain counterfeiter. Handle it as little as possible and separate the bill from your other cash by putting it in a marked envelope in the register that you can quickly access later. If you detect or receive counterfeit bills, file an official report by filling out this form from the US Secret Service which requires an individual to detail a suspected fraudulent transaction involving counterfeit money and hand it to the local authorities. After filling out the form or simply reporting a suspected counterfeit transaction, the last step, is to contact your local law enforcement authorities. Just get in-touch with the police station. They will be able to give you further instructions and contact other authorities as needed (generally the Secret Service). The best answer to fighting currency counterfeiting is education. While there are tools to help businesses detect fake money, they don’t mean anything if there’s a lack of knowledge in spotting them in the first place. If you educate yourself and your employees on what an authentic bill should look like and the security features it should have, you will be well on your way to detecting counterfeit bills and protecting your business from unnecessary profit loss. As we’ve mentioned repeatedly, one of the best ways to reduce the risk of counterfeit money is to reduce your dependency on cash transactions. A flat-rate payment processing provider like Fattmerchant makes is easy and affordable for your business to accept credit card payments. Fattmerchant offers a subscription-based monthly processing fee with no contracts, easy integration with established POS systems, and payments processed on secure networks. Get a free quote today. I have a $100 dollar bill and I can’t tell if its real the series number is 2009 A and it starts with a L but I jus can’t tell help!!! If you’re having trouble determining if it’s a real bill, you may want to purchase one of the counterfeit detection tools that we talk about at the bottom of the article. You can buy one of those Ultraviolet lights, that look like a small flashlight, and run on 3 AAA batteries. Most times they cost between $10 – $15. it’s normal, sometime i encountered that kind of issue. If you are here in Philippines, just go to any of the money changer but be aware that some of money changer are sensitive for that case that may lead not to accept your bill. TORN and FILTHY BILL IS ANOTHER ISSUE and it is case to case how severe the damage, at the end it is always the money changer decisions if they want to accept your bill or not. I have a $100 Bill everything looks good. The series start LB, and says 2009. But I can’t see the bells/ $100 Mark in the strip. Your bill is supposed to say Series 1996 not Series 1993. The letter A corresponds to Series 1996. Not sure about this one. Maybe one of our readers will be able to provide some help. I have a 100 dollar bill. The corner of the bill is ripped of revealing a see through plastic.